Thinking About an Outdoor Shower? Consider These Plumbing Tips First! 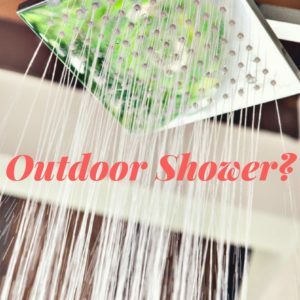 Outdoors showers are becoming increasingly popular and as the weather warms up, the prospect of showering in the fresh air sounds more and more appealing. Outdoor showers are great for washing off beach dwellers and cleaning up grimy gardeners, sweaty little leaguers, and muddy mutts. There are many benefits to having an outdoor shower and you have every reason to make this addition to your home. However, consider these factors before you make the actual installation! This is the most important issue with outdoor showers! Choosing a location should be your first step. Installing your outdoor shower on a wall adjoining a kitchen, bathroom, or laundry room is your best bet. This is because these rooms already have hot and cold pipes. Although, some homeowners have a specific reason that they want their shower in a different location. For example, you may want the shower by the pool for a post swim rinse or close to the backdoor for easy access after a sweaty jog. If this is important to you, you can make it work. However, when deciding on a location, it is important to consider that piping your water supply to a new area can often get pricey. You should also consider drainage when installing an outdoor shower. Many state or local governments require citizens to dispose of gray water or water contaminated by soaps and shampoos. To keep this grey water from draining into the soil surrounding your shower and possibly contaminating groundwater, you must install an appropriate drainage system. This will be easiest if your location is close to your home’s plumbing and you can drain the contaminated water into an existing line. If you want both cold and hot running water in your outdoor shower, you may want to consider installing a pressure-balance valve to prevent scalding. Another huge concern is the ability to drain pipes when the temperature drops outdoors. Water that is trapped inside can freeze and crack pipes. To prevent this from happening, homeowners should install shutoff valves in their home with pipes traveling on a downward slope. It is also a good idea to invest in a shower head and riser that can unscrew to get the maximum amount of water out of the pipes.